Hover over each image to view each team members personality! Liz is Dr. Paulson’s wife and she is the glue that holds us all together. She is fair, caring, and so understanding. Aside from being an amazing wife and mother, Liz leads weekly bible study and is very involved at her local church. In her spare time, we can often find Liz at Disneyland with Dr. Paulson and their two gorgeous kids. Amy has been in the field of dentistry since 1997. She has worked on both the clinical and the administrative side. From discussing your specific treatment plan to explaining your insurance and financial contract, Amy will get you started on your orthodontic journey. She has impeccable organization skills and truly understands the ins and outs of orthodontics. Amy is the proud mom of Hailey and Zane who both have Paulson Ortho smiles. She enjoys camping and loves being outdoors with her kids. Jennie started her career in Orthodontics in 2003 and joined our team in January of 2018. She loves meeting and interacting with our new patients and watching their confidence grow as their smiles transform throughout treatment. Her goal is to make every patient feel comfortable and happy to be here. When she isn’t at work, you will find her with her family. Her husband Josh along with their three children enjoy camping, hiking and going on new adventures. Their oldest son is currently serving in the military and is stationed in Japan. Margaret is our Scheduling Coordinator and is always there to help you when you need it. From scheduling your next appointment to greeting you the moment you walk through our door, Margaret is ready to make sure you are organized and prepared for every appointment. In her spare time, Margaret loves hanging out with her husband Jeff, her three kids and her five grandchildren! Dina has been in dentistry since 1986. She has a profound understanding of insurances. She not only explains and bills benefits for you, but she also helps answer your calls, schedules your appointments and does it all with a smile. Her positive attitude makes her an amazing team player. Both Dina and her husband have had braces with Paulson Orthodontics. In her spare time she enjoys riding her quad and mountain biking with her family. She also enjoys gardening and has a decorative flair. She has actually done some of the painting and decorating in our office. Sydney is one of the first people you will speak to, when you call to set up your appointments. She will answer any questions you may have with a smile on her face. She is always eager to help others and loves being very hands on, in the office. Making our new patients feel welcomed is one of her favorite things to do, so she loves decorating our welcome board to make everyone feel special. When she isn’t at the office you will find her enjoying time at home with her Fiance Robert and their two kids Peytyn and Parker. 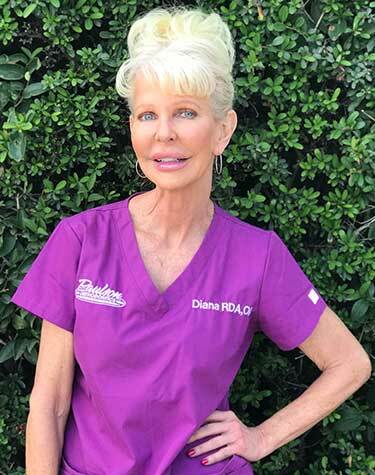 Diana has been in orthodontics since 1983 and with our practice since 1988. She is always ready to explain your procedures and answer all of your questions. Her laughter often fills the air. Diana loves working out, reading, traveling, shopping and gardening. Evy has been in the dental field since 1993 and has been an orthodontic assistant since 2003. She actually met Dr. Paulson during his residency at Loma Linda University. She is talkative and friendly and is wonderful at explaining the ins and outs of braces. Her smile and charisma light up our office. When she is not working, Evy loves traveling with her husband and spending time with her daughters, grandkids and furry babies. Sara recently started her career in the Orthodontic field. She chose ortho because she loves to see smiles change and the confidence it brings patients along the way. She is very positive, kind and is always smiling. When Sara is not working she loves taking care of her kitties, hiking and being very active in her church. Andrea is one of our friendly and knowledgeable, back office registered dental assistants. She has been in the Orthodontic field for 16 years. She is compassionate and dedicated to making the patient feel comfortable with every appointment and procedure. Andrea enjoys spending time with her family, shopping and party/event planning. She is married and has 3 little boys. Kim started her career in endodontics in 2001. In 2006 she dove into Orthodontics and found her niche. Kim is so patient with the little ones and has an art for explaining treatment and instructions to both patients and parents. She truly cares for each one of our patients and is a huge asset to us. Kim and her family enjoy sports and camping. Kim has been married since 2006. She has two boys, Ryder and Liam. Terri has been in the dental field since 1990 and keeps our lab running smoothly so the assistants can provide great care for our patients. She has lived in the Banning/Beaumont area all of her life, Terri has four adult children, two grandchildren and a wonderful husband. In her free time she enjoys reading, watching movies and going on long walks. She is a proud cancer survivor and she is very active at her church Wildwood Calvary.